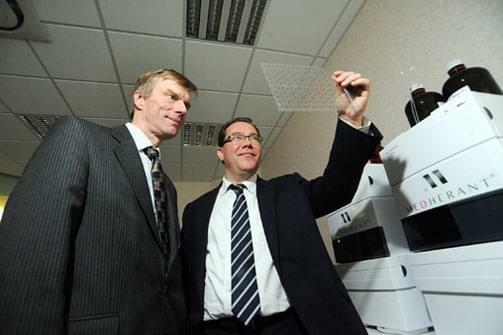 A West Midlands company that has developed a patch that can deliver ibuprofen – and a range of other drugs – through the skin has invested in new technology, new offices and is taking on new staff to meet demand. Medherant, which is based at the University of Warwick Science Park’s Venture Centre after spinning out of the university, made international headlines at the end of last year after revealing it had developed an innovative adhesive patch with the capability of delivering high doses of the painkiller straight to where pain is felt. The company has been inundated with interest in the product and is now in talks with a host of pharmaceutical firms from around the world. Medherant, which is also close to securing another round of investment, is carrying out further tests on its patch and it should be ready for clinical trials later this year. The earliest it could be ready for public use is within two years. The firm is now set to draft in staff in business development, administration, lab and scientific roles and has invested in a new machine that will speed up the process of making the patches. The company, which was established at the start of 2015, is also continuing to utilise its relationship with the University of Warwick and that will see students helping to undertake research with the firm. Nigel Davis, Medherant’s CEO, said: “We’re moving out of the ‘start-up’ offices at the Science Park and into commercial space within the park, such has been the interest since we first made the announcement about the patch. “The fact that the University has a Science Park linked to it has been a huge asset to the business because it means you get the best of both the academic and commercial worlds. We have been able to expand due to the flexibility of the Science Park and it means we can add to the team. Dirk Schafer, a project manager at the University of Warwick Science Park, said the company was a great example of how the park can help a business to grow. He said: “It’s been a whirlwind few months for Medherant. They’ve gone from start-up in our Ignite incubator to suddenly attracting international interest in their product in a very short space of time.